P hysics can take you far and wide. Our faculty have collaborators around the world and regularly take students to participate in experiments off-site at large laboratories. Dr. Alton is involved with dark matter searches deep underground at the Laoratori Nazionali del Gran Sasso (LNGS) with the Dark Side Experiment and underground science outreach at Sanford Underground Laboratory at Homestake. Dr. Wells has an active collaboration with researchers at the J.R. Macdonald Laboratory, a large facility for atomic, molecular, and optical physics located on the campus of Kansas State University. Dr Grau is a member of the PHENIX collaboration at Brookhaven National Laboratory, where he and students study relativistic heavy ion collisions. Presenting your results is an essential part of the scientific process, and so our students travel to regional and national meetings, interacting with scholars from around the world. Physics students have also recently spent internships at PraireGold Venture Partners, Michigan State University, the University of Oklahoma, Montana State University, and the Stanford National Accelerator Laboraotry. Pre-engineering students have interned with Peter Kiewet Sons’ Inc., Avery Weigh-Tronix, the University of Minnesota, and at NASA’s Glenn Research Center and White Sands Test Facility. Physics majors often take advantage of the various study abroad programs available at Augustana. Students have spent semesters at the University of Lancaster in England, James Cook University in Queensland, Australia, and the University of Edinburgh in Scotland. Many others have had shorter international experiences. In addition, Washington University in St. Louis holds engineering courses for students at affiliated schools during the January Interim term. 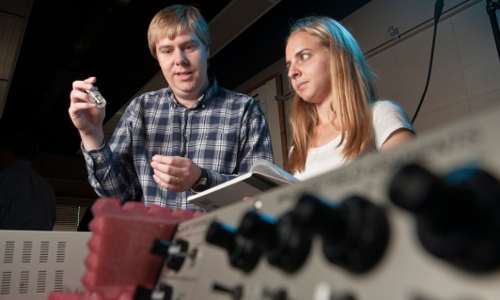 Many students use this program to experience engineering school before leaving Augustana. What can you do with a physics major when you graduate?